National POW/MIA Recognition Day is observed every September 15. This annual event honors missing service members and their families, and highlights the government’s commitment to account for them. Local POW/MIA ceremonies are encouraged throughout POW/MIA Recognition Week, culminating with countless events and the national ceremony in Washington D.C. 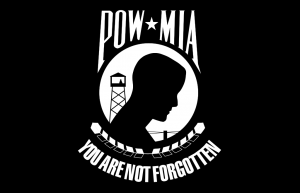 Here are some resources that focus on POW/MIA from various wars. It is separated into state/territory. The information for each state/territory is separated into “Accounted For” and “Unaccounted For”. It is separated into state/territory. Each has an “Unaccounted For” list. This database contains a listing of U.S. soldiers, sailors, marines, and civilians (presumably mainly military employees and contractors) who have been reported by the U.S. government as Missing in Action (MIA) or Buried at Sea from World War II. This database provides military details on almost 30,000 military (and a few civilian) prisoners held by the Japanese during World War II. This is one of the most comprehensive lists of American prisoners of Japan during WWII available. This database contains a listing of World War II British Army, Navy, and Air Force prisoners of war. This collection of records from The National Archives includes papers from the Foreign Office, Colonial Office, War Office, Admiralty, and Air Force. The records contain the names of thousands of prisoners from nations around the world. This is a military history listing of repatriated prisoners of war from World War II, including records of 143,374 individuals captured during World War II. This reference report provides an overview of the electronic data records in the custody of the National Archives that relate to U.S. Military causalities, missing in action, and prisoners of war from the Vietnam War era.